Restoration Resources in Boston&apos;s South End carries an array of salvage from the city&apos;s Brownstones and Tudors. Recycling old building parts is far from a novel idea. In the 6th century, architect, mathematician and city planner Anthemius incorporated 107 columns salvaged from ancient ruins to build Saint Sophia Cathedral in Istanbul, Turkey (the fourth largest cathedral in the world). In the early 20th century, architect Julia Morgan built William Randolph Hearst&apos;s mansion in San Simeon, California, incorporating entire ceilings, walls, and floors salvaged from medieval castles and churches. Since the late 1970s, though, our growing appreciation of rescued building parts has led to a dwindling supply of salvage. As a result, prices have skyrocketed, restricting many of those one-of-a-kind treasures to the highest bidder. Luckily this active market has introduced several different salvage sources for the old-house restorer. From nonprofit organizations to reproductions, from the Web to Europe&apos;s junkyards, the venues for salvage have become as eclectic as the salvage itself. Perhaps the biggest development in recent years has been that salvage marketplaces look more like a salon at Musée des Beaux Arts than Fred Sanford&apos;s front yard. Many dealers have shifted to predominately high-end decorative architectural antiques rather than mundane building materials, and for good reason: They command higher prices. Many dealers have turned to Europe, Africa, and South America for such eye candy items. These upscale boutiques cater to old-house restorers with healthy budgets as well as lovers of antiquity. Housed in a defunct grain warehouse in San Jose, California&apos;s, historic district, Artefact Design and Salvage is such an attractive retail space it has won a national award for its good looks owner David Allen even rents the shop for parties. 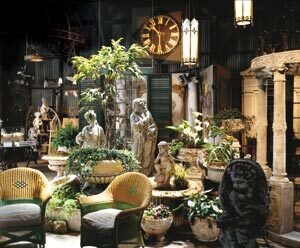 In 1996, Allen began selling from his front yard a host of Classical and Neoclassical garden ornaments that he had handpicked from demolition sites on the East Coast. Once his clientele started to block street traffic he knew it was time to move his operation to a larger space. 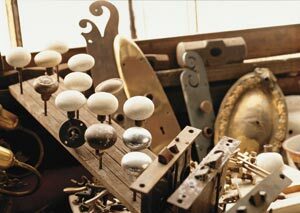 Open two years, the shop has become one of the leading high-end architectural antique salvage shops on the West Coast. "Luckily the recycling movement, nostalgia for craftsmanship and poverty has saved many old buildings from the wrecking ball," says Allen, who lectures on the history of architectural salvage. Evan Blum knows salvage. A 30-year veteran of the industry, Blum, owner of Demolition Depot in New York City, has saved ornament from such landmarks as the Commodore Hotel, the Audubon Ballroom and Horn and Hardhart&apos;s Automat. "In the 70s no one saved anything," says Blum. "I&apos;d just go to the edge of a demolition site and haul off a doorway." Today his business is booming with such celebrity clients as Robert DeNiro and Isabella Rossellini. The four-story, early 20th-century building in Harlem is truly a Gimbels of architectural salvage: first floor, decorative glass knobs and lamps; second floor, interior and exterior doors; third floor, tubs and sinks; fourth floor, plantation shutters and windows. When Andy Rooney of CBS&apos;s 60 Minutes visited Blum last year to report on who still takes baths, Blum showed him Gertrude Vanderbilt Whitney&apos;s tub from a house in Old Westbury, Long Island, pointing out that such a tub would fetch three, six or even seven thousand dollars. Owner of Architectural Artifacts, Inc., in Chicago, Stuart Grannen creatively displays his collection in 30,000 square feet of retail space. Grannen is a purist who deals only in antiques, no reproductions. His collection includes a WWI biplane, a 14&apos; Art Deco sign from a train station in Buffalo, 150-plus terracotta lions, stone fountains, Daniel Burnham window grilles and a private collection of Louis Sullivan relics. Grannen makes several buying trips a year to Europe to collect the worn wares. Each piece in the shop is labeled with the price and origin. "People want to know where a piece comes from," says Grannen. "It adds so much to the story." The web is a great place to start your search for that perfect Colonial Revival mantel (check out our comprehensive directory). Most salvage shops have inventory posted online, which literally opens up the world market to you at the click of a mouse. Although you may find pictures of wares on your computer, many dealers won&apos;t sell over the web. "It&apos;s really a touchy-feely market," says Mark Charry of Architectural Antiques Exchange in Philadelphia. People are spending a lot of money and want to know what they are getting first hand. Salvoweb.com, a UK-based web directory for 75 salvage dealers from Canada, England, France, Ireland, Scotland, and Wales, has established a code of ethics for the dealers they represent. The aim is to give buyers confidence that items purchased have not been stolen or removed from a historic property without permission. A New England dealer browsing Salvoweb&apos;s theft alerts realized two urns stolen from a UK household were in his showroom. 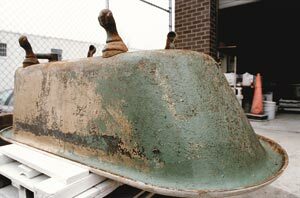 "The salvage dealer contacted Salvo, and the urns were returned," says Kay Thorton, a partner in Salvo. Thorton says the biggest change in European salvage is the introduction of reproductions. Salvo also publishes SalvoNEWS and Salvo Magazine, both dedicated to the European salvage industry. Arcsal.com, a British company, also signs a host of UK architectural antiques dealers and displays a selection of their stock on the web. Visitors can search by category for the desired piece. Arcsal won&apos;t conduct the full sale over the Internet, but rather encourages the customer to contact them via phone to discuss the purchase. Do you want to replace that 1970s vanity in your 1930s lavatory with something more historically appropriate, but can&apos;t afford the porcelain wall-mounted sink at the salvage shop? With salvage items becoming more expensive each year, there is still hope for those on a budget. "You could build a house out of what some people throw away," says Leslie Kirkland, executive director of the Loading Dock, a nonprofit building materials warehouse in Baltimore, Maryland. In the business of servicing low-income homeowners who have restoration projects, the Loading Dock has rescued 33,000 tons of building materials from landfills. To shop at the 21,000-square-foot emporium that sells donated surplus materials as well as salvage, you must be affiliated with a low-income housing organization, a community center or neighborhood improvement group. However, the Loading Dock has recently started Reuse Friends, a program that allows preservation group members to come and shop for salvage in a designated area. Here they&apos;ll find goods at a fraction of the cost at most for-profit shops. Windows go for $10 to $40 a pop, while a Carrara marble mantelpiece in perfect condition could fetch $300. Most of the salvage pieces are donated from Baltimore&apos;s older homes going through gut rehabs. The organization also receives donations from hotels and municipal buildings. You could find 1940s porcelain wall-mounted sinks from Washington, D.C.&apos;s, Roosevelt Hotel or 20 pairs of French doors from a historic Reistertown, Maryland, house. A clawfoot tub in good shape could be had for $100. 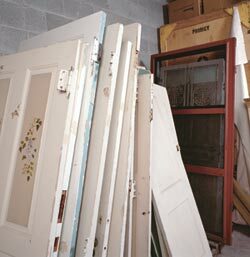 Interior doors go for about $10 to $25, exterior doors $25 to $40. Today many charity thrift shops around the country sell more than fur wraps, bell-bottoms, and costume jewelry. Antiques and architectural elements are popping up on charity shop sale floors and as a rule of thumb these thrift shops price merchandise from one-third to one-fourth below the market cost. Housing Works, a nonprofit organization supporting New York City homeless who are HIV-positive, has sold such architectural salvage as eave brackets, a set of eight Victorian walnut doors and gilded brass bath fixtures out of its four thrift shops. "We receive a wide variety of antique architectural elements old porcelain sinks, pediments, mantels," says Matthew Aquilone, the shop&apos;s visual director. We have a number of celebrity donors such as fashion designer Marc Jacobs, who recently donated 15 light fixtures. Some of the most interesting pieces Aquilone has spied are alabaster capitals and columns, antique bricks, and Dutch doors. 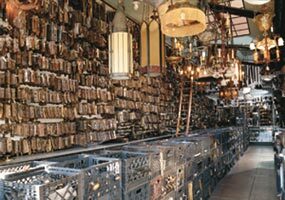 Although high overhead has forced many to close, a few preservation organizations still run salvage yards with more affordable merchandise. Because salvage rights usually go to the highest bidder, these shops don t have a vast inventory and may be open only one or two days a month. Call your local preservation office to see if your city has such a program. Habitat for Humanity also operates re-use shops called Re-Store. Dealing mainly in building supplies, the organization occasionally receives donations from demolition sites. Just like trying to find the match for a lost earring, finding one Victorian cabinet pull to complete a set of eight can be virtually impossible. Liz&apos;s Antique Hardware in Los Angeles, California, feels your pain. For $10 owner Liz Gordon will attempt to match hardware based on photographs. We may find all the hardware you need in a single pattern but the pieces might have different manufacturers finishes, says store manager Terri Hartman. If you want all the pieces to be finished in the same material, take them to a plating company. Send Vintage Plumbing Bathroom Antiques in Northridge, California, your vintage bath fixtures, and for a small fee they&apos;ll refurbish them for you. They carry salvaged vintage bathroom items from Kohler, Standard Sanitary Company, and L.Wolff Manufacturing among others. The Brass Knob in Washington, D.C., has been in the salvage business since 1982 and has a collection of more than 400 clawfoot tubs in stock at any given time. Although the company doesn&apos;t do the work on-site, it will send tubs out for refinishing for about $450. Niche salvage is also big. David Caligeros now restricts the inventory of Remains, once a full-line salvage shop in New York City, to strictly salvage and reproduction lighting fixtures. Uptown, across from Demolition Depot, Schmuck Brothers opened last year, selling New York&apos;s largest inventory of salvaged mantels in its five-story warehouse. You&apos;ll find nearly every material and period represented in this hip brick warehouse. If your search for the item that will finish off your restoration project has come up short, there may still be a happy ending. People have realized the value of what&apos;s in old houses and are keeping them rather than trashing them, says John Williams of New York City&apos;s Urban Archaeology. While the company is still selling unique salvage items, in recent years it has delved so deeply into reproductions that new merchandise has become 90 percent of its business. The move began when the shop was down to its last Carrara marble washbasin from the Saint Regis Hotel and the owners replicated the sink. Also imposters are the company&apos;s lines of Walter Gropius door levers and Yale Club nickel-plated towel racks. The second floor houses their tile showroom with reproductions from the Arts & Crafts period. Mark Charry of Architectural Antiques Exchange in Philadelphia started in the salvage business in 1977 when his college began gutting old houses on campus to use as administration offices and classrooms. "They were dumping loads of beautiful windows, doors, and mantelpieces into the trash," says Charry. He took the initiative to save these pieces and start his own business. Although his main thrust is still salvaged goods, he too has branched out, selling reproduction Victorian-style doors and Regency, Colonial and Art Nouveau mantels. 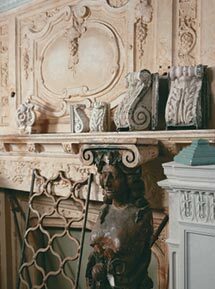 Charry also shops in Europe several times a year, retrieving architectural antiques such as 16th-century limestone mantelpieces perfect for America&apos;s early 20th-century Tudor houses. "Measure, measure, measure," says Bill Raymer, owner of Restoration Resources in Boston, which has one of the best selections of architectural salvage in that city and fairly priced. "Look at the scale of what you&apos;re purchasing in relation to your house. An oversized piece can overwhelm a room. 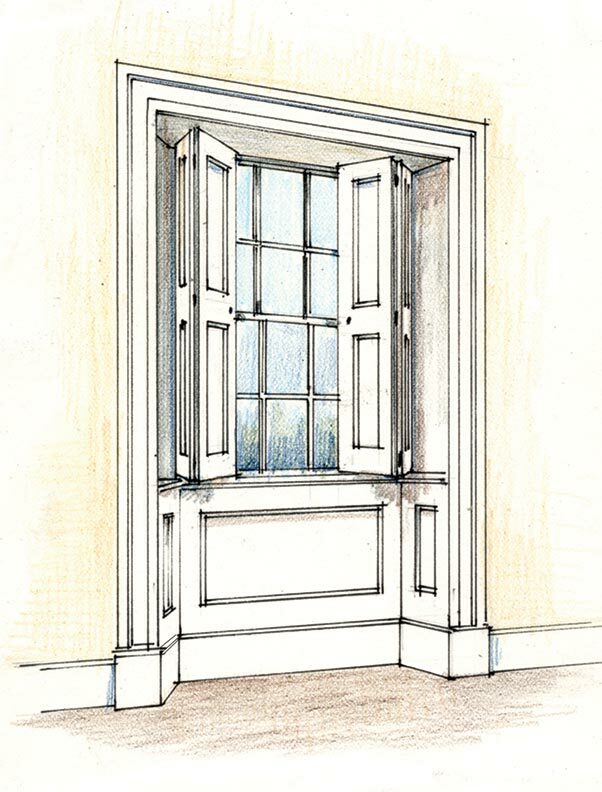 Don&apos;t forget to include the thickness of a door as well as the height and width. 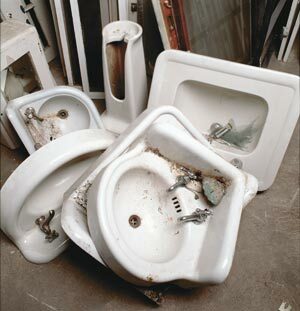 Windows are especially hard to fit, so much so that many salvage dealers have stopped selling them." "Many old toilets don&apos;t meet code today," says Raymer. "You need a 1.6-gallon flush; also find out about overflow drains in the bathtub plumbing you&apos;re buying." A mantel&apos;s openings may not meet today&apos;s size code. "Check the clearance from the firebox opening to the wood surround," says Raymer. Vitreous china is of a higher quality than porcelain-enameled sinks and tubs and is priced accordingly. When it comes to buying marble, Raymer suggests staying away from pieces that have been painted. "Marble is porous and the stains are hard to get out. Look at the quality of the casting when purchasing cast-iron garden urns." "Older pieces have much better quality," says David Allen of Artefact Design and Salvage. "Details are clearer. If a piece is welded it was made after 1920." 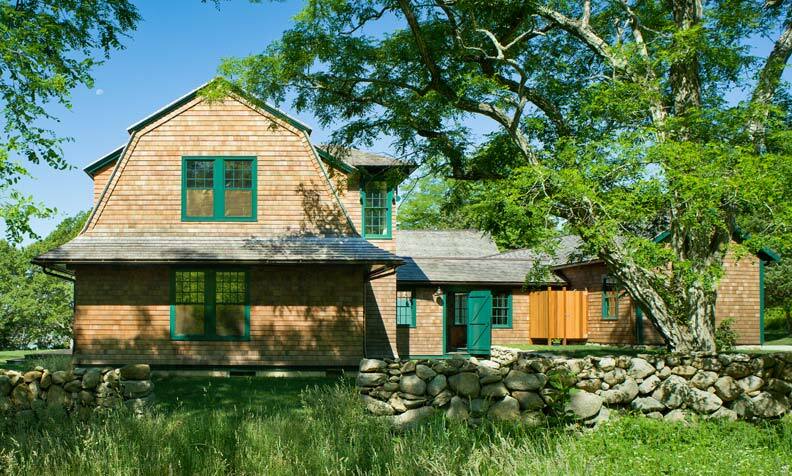 "Know where a piece came from," says architect John Milner, AIA, of John Milner Architects. "Sadly, there&apos;s a lot of stolen property out there." 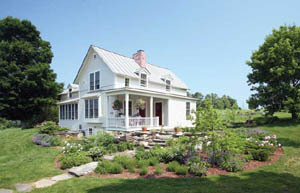 Establish the period and style of your house before striking out. Allen suggests asking salvage dealers if they have old building material catalogs to help you determine what style might be appropriate. If your house dates to the 1700s, chances are you won&apos;t stumble across authentic iron thumb latches or strap hinges for your door restoration you&apos;ll have to rely on good reproductions. If your house is post-1865 you&apos;re in luck. "Victorian hardware was the height of the American decorative hardware industry filigree work was very common," says Terri Hartman of Liz&apos;s Antique Hardware in Los Angeles. While high-quality cast brass is becoming scarce, pressed-iron and brass is still available in abundance. Milner doesn&apos;t introduce salvaged pieces into his restoration projects. "I don&apos;t like to confuse the project by bringing in materials from other sources," he says. Instead he will have the missing or damaged pieces replicated. "Historic reconstruction is another matter. I bought part of a room 15 years ago and didn&apos;t have a place for it," he says. "I finally designed a room around it." Milner uses the salvage materials as they would have been used in the past, incorporating entire ceiling beam systems for instance, not just as ornament but to serve as structural support. Moldings add beauty, shadow lines, texture, and dimension to a space—and they conceal seams and joints between ceilings, walls, and floors.